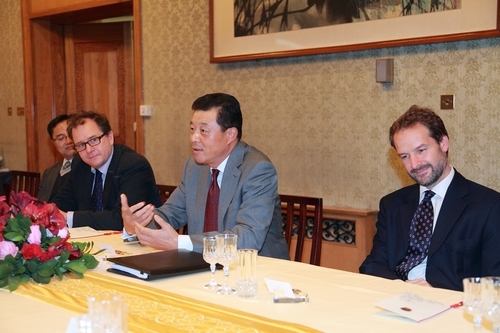 On October 25, 2012, Ambassador Liu Xiaoming held a roundtable at the Chinese Embassy with editors of major British media. Lionel Barber, Editor of the Financial Times, Frederick Studemann, Comment and Analysis Editor of the Financial Times, Edward Carr, Foreign Editor of The Economist, Alagare, a famous BBC news presenter, Raymond Li, BBC Head of Chinese Service, Sarah Whitehead. Head of International News of Sky TV, Alex Spilius, Diplomatic Editor of the Telegraph, Alastair Macdonald, Editor of Reuters World Desk, Tim Singleton, ITV News Editor, Lindsey Hilsum, Channel 4 News’ International Editor, Julian Borger, the Guardian’s Diplomatic Editor, and Seumas Milne, the Guardian’s Comment Editor, attend the roundtable. 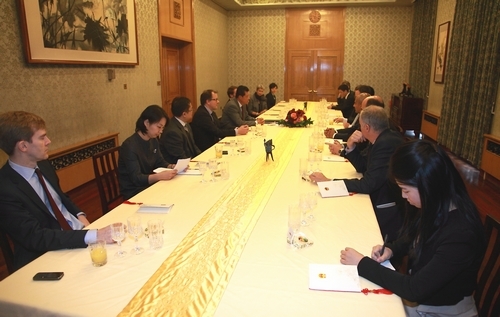 Ambassador Liu mainly elaborated China’s positions on the Diaoyu Dao issue. He also answered the participants’ questions on the 18th National Congress of the Community Party of China and the international hot topics. On the Diaoyu Dao issue, Ambassador Liu said that Diaoyu Dao is an inherent territory of China since ancient times. The Diaoyu Dao dispute arose from the Japanese government’s illegal “purchase” of Diaoyu Dao. It is completely caused by Japan. China has reiterated its positions and concerns to Japan through various channels, requiring that Japan should consider the overall interests and not make wrong decisions. But Japan insists its wrongdoing and illegally “purchased” Diaoyu Dao. This grossly violates China’s territorial sovereignty and serious hurts the feelings of the Chinese people. China is forced to take necessary measures to safeguard national territorial sovereignty. These measures are totally justifiable and must be taken by any responsible government. China always adheres to the understanding and agreement on “shelving the Diaoyu Dao issue and waiting for a future settlement”, which was reached between the leaders of the two countries during the negotiations for normalizing relations in 1972 and for concluding the “Sino-Japanese Treaty of Peace and Friendship” in 1978. China has shown maximum restraint and made tremendous efforts for the development of the China-Japan relations built in the past 40 years. In recent years Japan reverses its positions on the Diaoyu Dao issue. It does not even admit the existence of a sovereignty dispute over Diaoyu Dao. Such a position is an outright denial of the understanding and agreement reached between China and Japan. Japan is just playing the victim by accusing China of attempting to change the current situation of Diaoyu Dao with strength. China always adheres to an independent foreign policy of peace. It is committed to good-neighbourly partnership with its neighbours and pursues a path of peaceful development. As an important builder of cooperation in Asia, China has long been committed to promoting and participating in the regional cooperation and has made tremendous contributions to the regional peace, stability and development. In recent years, regardless of the strong voice of all other countries in the region to seek peace and development, Japan inappropriately stresses regional military security and maritime rights to intensify the contradictions and conflicts among the countries in the region and find an excuse for its active expansion of armament. Recently, Japan’s territorial disputes with its close neighbours, including Russia, South Korea and China, are all escalating. These disputes have one thing in common. They all show Japan’s attempt to deny the outcomes of the World Anti-Fascist War and to challenge the post-World War II international order. As British Prime Minister Winston Churchill once said, “attitude is a little thing that makes big difference”. Japan has never seriously reflected on its military fascist past in the World War II and made a serious apology. Instead, it often tries to deny the history and facts. The high-rank officials of the Japanese government often pay homage to the Yasukuni Shrine, where the class-A war criminals in Japan are still honoured. A high-level official of the Japanese government claimed during his recent visit to Britain that “the relevant disputes should be separated from historical issues”. But history is inseparable. When asked how to settle the Diaoyu Dao dispute between China and Japan, Ambassador Liu said that Japan must stop all erroneous acts of violating China’s territorial sovereignty and come back to the track of resolving the Diaoyu Dao issue through negotiations. When it comes to the 18th CPC National Congress, Ambassador Liu introduced the preparation of the Congress. He pointed out that the 18th National Congress of the Communist Party of China is an important conference in a critical period for China to build a well-off society in an all-round way, deepen its reform and opening-up and speed up the transformation of its economic development mode. The Congress will review the Party’s work over the past five years as well as what the Party has implemented since the 16th CPC National Congress. It will summarize the precious experience the Party has gained from the historical process of uniting and leading the people of all ethnic groups to carry on and advance the socialism with Chinese characteristics. The congress will also thoroughly examine the current international and domestic situation and draw out the guidelines and policies that respond to the call of the times and fulfill the wishes of the people. Ambassador Liu also answered questions on the economic development, urbanization, gap between the rich and the poor, regional imbalance and anti-corruption campaign in China, the situation on the Korean Peninsula, the Iranian nuclear issue, the Syria issue, the presidential election in the United States, China-US relations and other topics. FT Editor Lionel Barber and others said that the roundtable helped them to understand China’s principles and positions on Diaoyu Dao and other issues in a more comprehensive and accurate way. Sarah Whitehead from Sky TV said that Ambassador Liu’s viewpoints were inspiring and hoped to have an opportunity of exclusive interview with the Ambassador. Alex Spilius from the Telegraph wrote an article immediately after the roundtable, citing Ambassador Liu’s relevant comments on Diaoyu Dao Issue.